Q: What is the best oil to use in the transmission of a 322? Type F auto transmission fluid? Low viscosity Hy Gard? The tractor is used almost exclusively for mowing at this time. A: I used Type F Ford transmission oil and then switched to Dextron III when that came out. That also covered Type F in the Dextron III. The main thing is not to use Dextron or Type F in the John Deere 425, 445, 455, and the current X models as they have wet PTO clutches and wet brakes. Q: I have a Toro 38170/CCR Powerlite snowblower that starts alright, runs for about ten minutes, and then stalls out to where you can’t restart it. If you let it sit and cool for about ten minutes it will start and run for about ten minutes again before stalling. Any ideas of what this could be? Any input is greatly appreciated. A: Yes, it sounds like you are having problems with an ignition coil that is breaking down as it warms up, then when they cool they will start working again. Q: My 22 hp Kawasaki runs rough when engine is cold and even after it is warmed up it has a little surge and lacks some of it’s power. I have changed the oil, the plugs, and adjusted the valves to .010, changed the primary breather, and have had no improvement. Any suggestions? Also I would prefer the torque of a diesel…is there much to converting? Are the John Deere 445 and 455 basically the same GT.? The fellow I bought this from used, rebuilt the engine and it ran great for about the first 40 to50 hrs. Another question: regarding the 54″ deck, the belt has a lot of flop in it and occasionally jumps off when engaging. the belt is new. Thanks for any advice you might have. A: I would suggest you take a compression check on the engine and see how even they are to each other. If the compression is high and even, then check the intake system to see if you have any vacuum leaks. If that is O.K. maybe you’ll have to check into you fuel injection system. 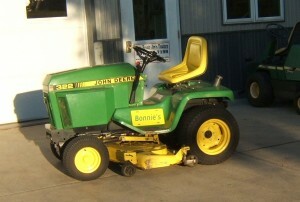 It would be much cheaper to trade in the John Deere 445 for a 455 than to make the conversion you asked about. With the belt problem, it sounds like you might have a bent pulley. If this is bent in on one spot it will make the belt get longer and shorter each turn of the pulley, therefore causing belt whip.